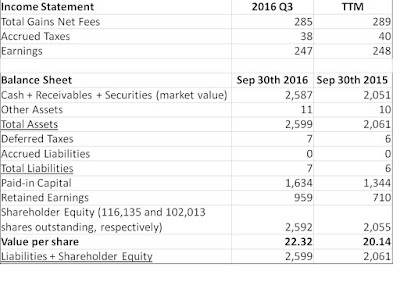 For the quarter ended September 30th, 2016, KVF earned $2.17 per share, increasing the value of each share to $22.32. This was one of those quarters where everything seemed to go right (or more importantly, where little seemed to go wrong) allowing KVF to handily outpace the usual indexes. KVF saw strong gains in some of its larger holdings, including Gafisa (originally discussed here), Surge Components (recently discussed here), Data Communications Group (discussed at great length here) and Fortune Industries (FDVF) following its sale announcement. This last company was not discussed on this site because I was still buying shares every now and again. 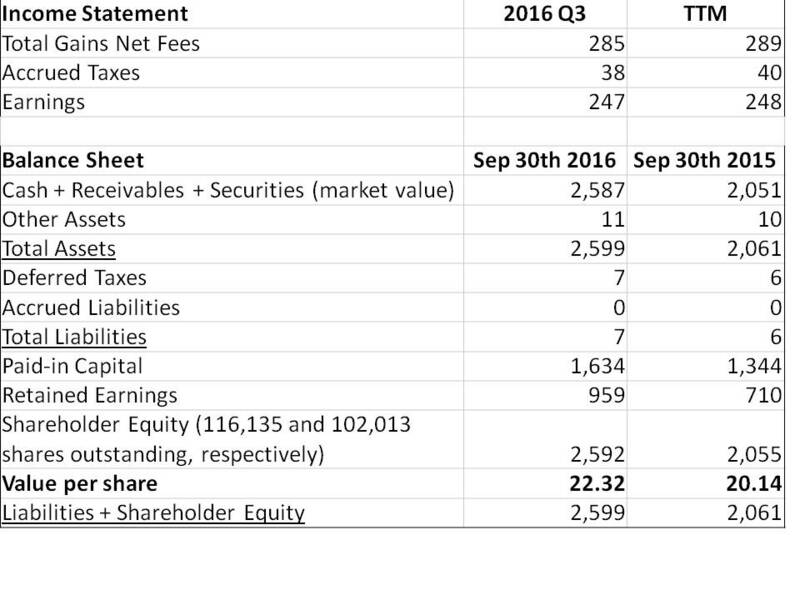 As previously discussed, KVF's portfolio has moved away from US large cap companies due to a lack of value. It is no coincidence that each company in the above paragraph is either tiny or not located in the US. Until valuations change, this can be expected to continue. Investors should not get used to this kind of return, however. It is unlikely that such outperformance will persist. Sometimes luck is on our side! There have been times in the past and there will again be times in the future when it will feel like luck is against us. Currency gains also contributed $0.12 to this quarter's results. KVF's current portfolio is not nearly as undervalued as it has been in the recent past, though this is a very subjective measure. As such, the focus right now is on turning over rocks (particularly small ones and those with accents, as discussed above) to increase KVF's potential returns in the future.